When Royce Yoder, artist, craftsman and owner of Royce Yoder Pottery, took his three children to see the Pfaltzgraff factory in York back in the 1990s, the company was manufacturing 160,000 pieces of tableware per day. Today their products are no longer made in the United States. According to the September 2017 IBIS World Industry Report, the ceramics industry has suffered from declining sales because of rising imports, but that doesn’t affect pottery artisans like Yoder. 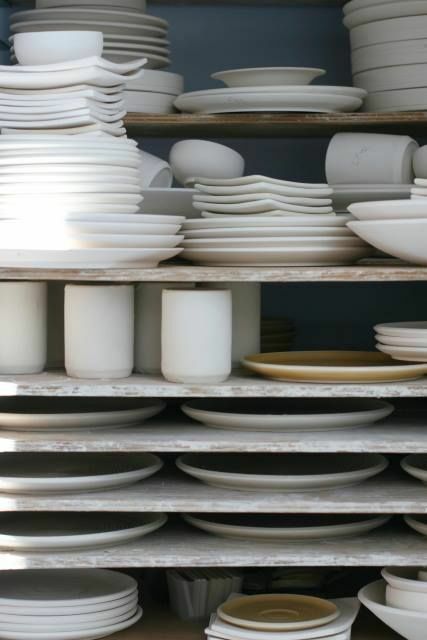 Pennsylvania has a wealth of small-scale producers and solo operators creating handmade tableware for an audience seeking something special for their homes. Yoder has been creating and selling his designs — bowls, casseroles, mugs, plates, vases — since 1983. He typically make 5,000 to 6,000 pieces per year by himself and by hand. Yoder’s studio is located in a barn on his property in Lederach, Montgomery County. “My commute is a walk through the pine trees,” he says. 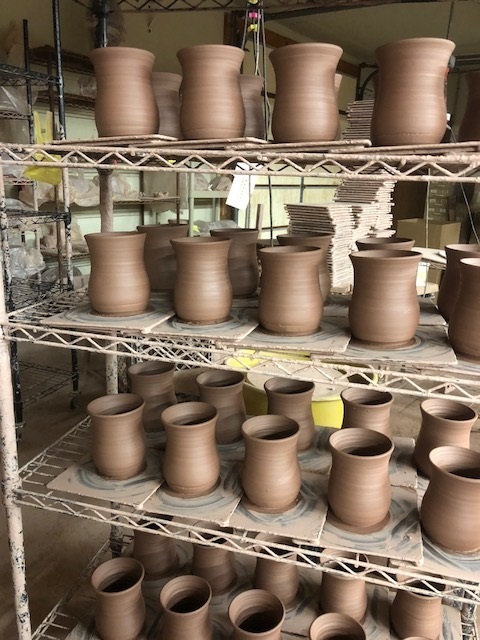 Yoder typically spends an average of 12 hours per day “throwing clay,” a term used when molding and shaping a ball of clay on a potter’s wheel. In September, an Ohio company asked him to create 350 rectangular bowls as a holiday gift for their employees. Yoder wrapped each piece in newspaper, placing them in white-handled shopping bags along with a note on care and handling — just in time for the holiday party. Teresa Chang is another standout tableware artisan. After earning a masters degree in architecture from Columbia University in 1992, she set up a pottery studio in her Brooklyn loft and began to do what she loved most: create porcelain ceramics. In 1997, Teresa Chang Ceramics debuted its dinnerware at the International Gift Faire and soon attracted clients such as Barney’s Japan, Takashimaya, and Dean & Deluca. She recalls when ABC Carpet and Home in New York offered her an open stock display table. “That really helped get my name out there,” she says. In 2001, Chang moved her studio to the Northern Liberties section of Philadelphia and began concentrating more on retail sales. Chang is known for her soft and vibrant color palette; she credits early Korean and Japanese pottery, and her mother’s appreciation for simplicity as influences. Denise Wilz finds her inspiration in traditions closer to home: namely the traditions and techniques of Pennsylvania German potters from the late 1600s to the mid 1800s. Wilz earned a BA in Studio Art from Moravian College but worked as a computer programmer for 18 years. In 2002, it was time for a change, and she opened Wilz Pottery in Macungie, Lehigh County. 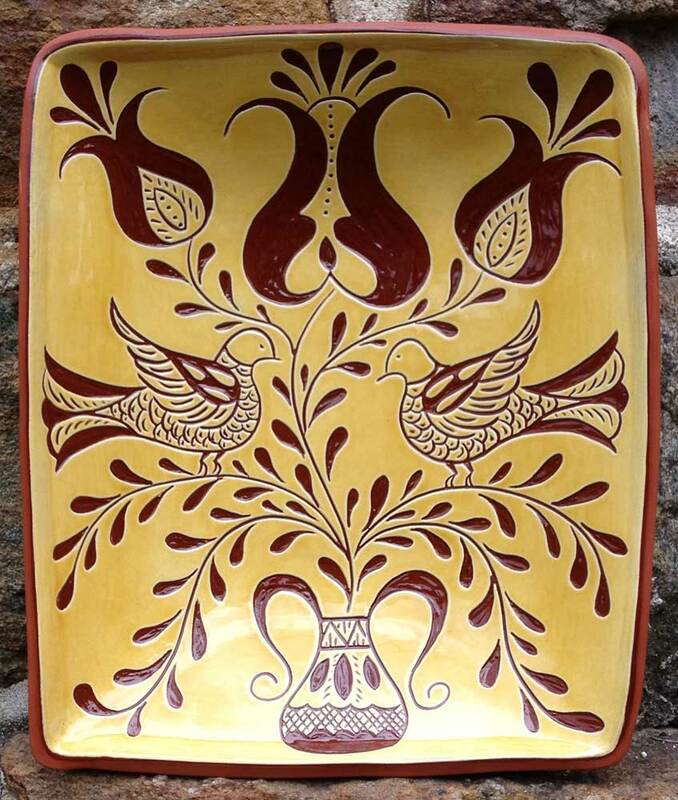 Today, working out of a house built in the 1700s, Denise creates one-of-a-kind redware. She is also president of the Lehigh Valley Chapter of the Pennsylvania Guild of Craftsmen. Her work, which begins with red earthenware clay, is created using replicas of hand tools employed by 17th century Pennsylvania German potters. The clay is rolled out and then draped over a plate or platter mold. Mugs and jars are made on a potters wheel. White earthenware clay is used in the decoration; Wilz also uses a “sgraffito tool” to scratch and slip cups in order to decorate the clay. Each piece is signed and dated, and the weather of the day is also noted on the back. Most Wilz Pottery customers buy her pieces for decoration, not everyday table use, though the glazes are food safe. 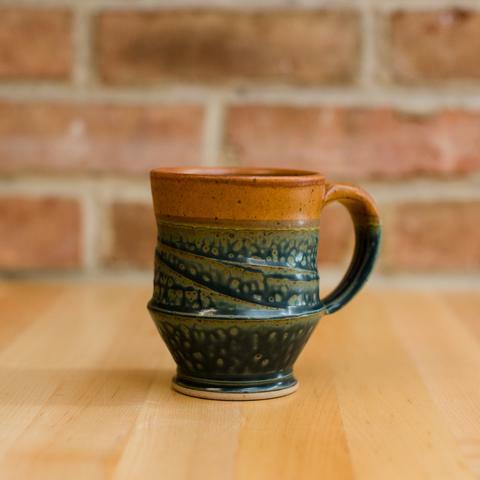 Some independent pottery artisans have chosen to scale their businesses and take on employees. JoAnn Stratakos, owner and founder of MudWorks Pottery, employs about 15 people at the company’s 9,000 square foot warehouse in Effort, PA, a town near Stroudsburg in the Poconos. 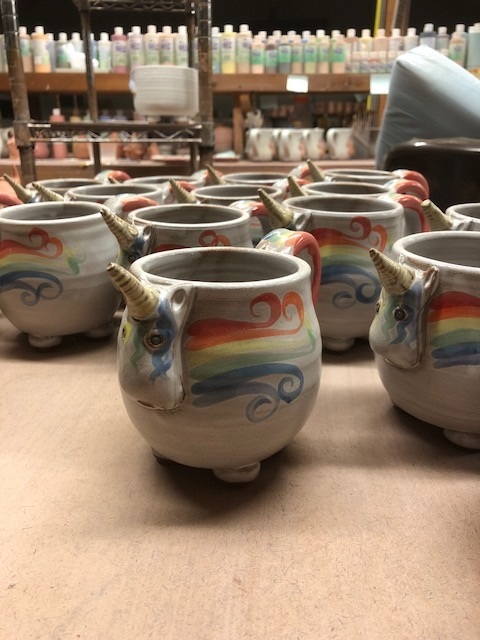 MudWorks may be best known as home of “Elwood, The Rainbow Unicorn,” a whimsical mug that hit the scene in 2012. A successful debut at an Orlando trade show led to a spot in the Uncommon Goods holiday catalog and a feature on the website — they sold out 900 units of Elwood during the 2014 holiday season and the rest is history. To date, the company has received orders for over 7,000 mugs and 5,000 Elwood cereal bowls. Mudworks produces much more than just Elwood. Stratakos develops all the designs, which include over 200 mug choices. GRAZIELLA DiNUZZO is a freelance writer and handles communications for the World Trade Center of Greater Philadelphia.